One of the deﬁning moments of the London 2012 Olympiad for many people was the sight of Oscar Pistorius running on his Flex-Foot Cheetah blades (Össur, Reykjavík, Iceland), competing and winning medals in the Paralympics. The world watched in awe as Oscar, a South African double amputee, loped down the track at a speed most able-bodied athletes would envy. Known by his nickname ‘Blade Runner’, Oscar showed the world not only his athleticism and sporting dedication but the wonders of modern limb replacement technology. However, there was another winning athlete at the 2012 London Olympic Games of equal commitment and sporting prowess but whom no one would have guessed was the beneﬁciary of a different type of modern medical technology. Chong-Wei Lee, the Olympic and world ranking No.1 badminton player from Malaysia, sustained a severe right ankle ligamentous injury during the Thomas Cup tournament ten weeks prior to the Olympics. As he was being wheeled out of the badminton arena, his participation at the upcoming Olympics was far from certain. Chong-Wei Lee was treated at the Kuala Lumpur Sports Medicine Centre using his own stem cells. His convincing win of the Olympic silver medal just ten weeks following a major ankle injury was the result of sheer determination, and we believe a little assistance from his cryopreserved peripheral blood stem cells (PBSC). In 2009, Chong-Wei Lee had suffered from recurrent knee tendinitis and underwent stem cell therapy. During this treatment his autologous PBSC were harvested, cryopreserved, and then injected around the area of tendinitis. The tendinitis resolved six weeks after the stem cell therapy. These same cells were used to treat his ankle injury in 2012. Modern athletes are constantly susceptible to performance-threatening injury as they push their bodies to greater limits and endure higher physical stresses. Loss of performance and training time can adversely and permanently affect a sportsperson’s career. Now, more than ever with advancing medical technology the answer to injuries may lie in biologic therapy. We pose, and will attempt to answer, the questions: “is it possible to deﬁne the potential of stem cell therapy as a regenerative procedure?” and “to what extent is total recovery and regeneration of musculoskeletal injuries now possible with stem cell therapy?“. The majority of the body of research on tissue engineering or regenerative therapy concerns the application and effi cacy of bone marrow-derived mesenchymal stem cells (MSC) with or without scaffolds. In many cases the MSC are cultured or undergo directed expansion into another form.1-4 There is, however, another option, that of autologous PBSC, often viewed as the underdog in regenerative medicine. There is much background literature supporting the safety of PBSC use. The abundance of haemopoietic factors and MSC suspended amongst a milieu of growth factors makes a promising biological agent. We have been using this potent cocktail clinically and have been able to demonstrate that stem cells differentiate into target cells and enable regenerative repair. 5, 6 The potential of this technique as a regenerative agent can be seen in three broad applications: 1) articular cartilage, 2) bone and 3) soft-tissue. At the Kuala Lumpur Sports Medicine Centre we have been using this technique successfully in all three of these applications and will illustrate each application in turn. Treatment of chondral lesions continues to be a clinical challenge. The structure and function of articular cartilage can lead to non-healing lesions after injury occurs, especially with defects superﬁcial to the tidemark zone. Well-established arthroscopic methods attempt to promote healing with marrow stimulation or the transferral of non-injured cartilage to areas of injury. A variety of techniques are established, including microfracture, chondral drilling, osteochondral autograft transfer, ostechondral allograft transplant, and autologous chondrocyte implantation. However experienced the surgeon, more often than not these treatments have resulted in the formation of ﬁ brocartilage and similar results with no clear superior modality.7-10 In an ideal world the treatment would result in hyaline cartilage formation, especially in the case of high performance athletes. 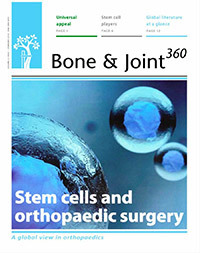 Articular cartilage-based stem cell regenerative therapies do have an evidence base in medical science with a number of clinical and experimental publications, including a randomised controlled trial illustrating the potential beneﬁts of stem cell therapy in promoting regeneration of articular cartilage.11 The ability to treat chondral lesions with minimally invasive arthroscopic subchondral drilling followed by post-operative intra-articular injections of PBSC in combination with hyaluronic acid (HA) is extremely attractive and, at ﬁrst sight seems too good to be true. What is even more compelling is that the science, surgical technique, harvesting and storage of the PBSC and the post-operative rehabilitation programme that encompasses this method have sequentially been developed to maximise the chances of high quality regeneration and repair. The goal of this therapy is to regenerate repair cartilage similar to the native hyaline cartilage in the knee joint, and the same principles are applicable to other joints. Chondral injuries do not aff ect just professional and college athletes, the disease burden extends to recreational athletes who suffer the consequential adverse effects on their quality of life, and in the older population chondral lesions can sometimes affect function and mobility. Fig. 1 A 34-year-old female presented with recurrent dislocation of her patella as an adolescent. Radiographs were taken a) pre-operatively, and b) immediately post-operatively showing evidence of subchondral drilling. Radiographs at c) six months and d) two years showed a progressive reappearance of the lateral patellofemoral articulation. A similar approach can be used in combined chondral injuries and meniscal tears. Figure 2 shows the arthroscopic ﬁ ndings of a 61-year-old orthopaedic surgeon and recreational skier. Two years following injury and after an unsuccessful arthroscopic debridement he was troubled by a persistent knee effusion, limited walking distance and lateral patellar maltracking with chondral lesions over the lateral patellofemoral joint. There was also an associated degenerated lateral meniscus and chondral injury in the lateral compartment. The patient underwent arthroscopic subchondral drilling together with lateral patellar release and subsequently received stem cell therapy. MRI scans at ﬁve months showed evidence of repair and regeneration accompanied with clinical improvement. Stem cell therapy is not just applicable to the knee, however, and we have successfully applied this technique to a range of joints. The ankle shown in Figure 3a exhibits a typical appearance of a large post-traumatic chondral injury sustained by a 36-year-old male while snowboarding. Pre-operative MRI scans and arthroscopic ﬁndings were consistent with a medial talar dome chondral lesion. A similar operative approach is used with debridement and subchondral drilling approach is used comprising of debridement (Fig.3b) followed by stem cell therapy. The patient’s subsequent postoperative (Fig.3c) and nine-month MRI scan remarkably show almost complete healing of the chondral lesions (Fig.3d). Fig. 2 Intra-operative views following subchondral drilling with the corresponding MRI scans after surgery and progressive healing at ﬁve months of the lateral trochlear, lateral femoral condyle, lateral tibial plateau and lateral patellar facet. There are an increasing range of biological agents whose use is indicated and accepted in treating bony nonunion. These agents range from simple hydroxyapatite and calcium salts to growth factors(rhBMPs), stem cells and electromagnetic bone stimulators. Stem cell applications in nonunions are well established in the scientiﬁc literature,14-16 but this application of cellular autograft is not yet widely reported in the clinical setting. Stem cells offer a tantalising combination of biological augment, and unlike growth factors are capable of long-lasting effects. The potential of this approach is seen in the challenging case of a 51-year-old presenting with the combination of established proximal tibial malunion and ACL deﬁ cient instability can be challenging to treat. The patient had a long standing varus malunion and a 3 cm shortening of his tibia presented with pain, instability and deformity. The patient’s medial compartment was bereft of any articular cartilage. We used a modiﬁed Taylor Spatial Frame for osteogenesis which we augmented with stem cell therapy. Application of a Taylor Spatial Frame in combination with tibial and ﬁbular osteotomies was followed with distraction osteogenesis at a rate of 1 mm per day, commenced the day after the tibial and ﬁbular corticotomies. We supplemented the standard treatment with stem cell therapy one week following corticotomies. Autologous PBSC were harvested from the patient and injected percutaneously into the corticotomy sites. We were able to demonstrate callus formation two weeks after distraction osteogenesis (one week after injection of PBSC, Fig.4a). 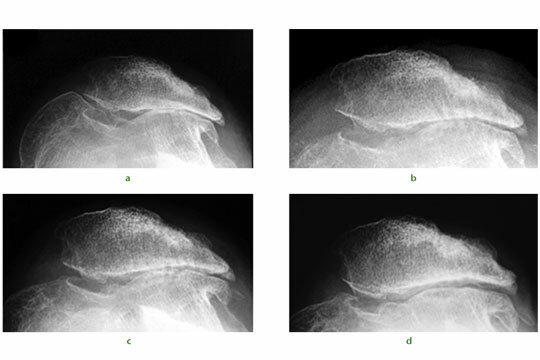 Two further weekly injections of PBSC were given during the osteogenesis process and almost complete healing was seen at four months (Fig.4b). Although a similar result could have been easily achieved without the injection of PBSC there is the potential to reduce frame time and morbidity associated with extended frame wear. At ﬁnal follow-up the patient did not have any equinus deformity of the ankle or a loss of initial knee movement, regaining 50° of knee range of movement following the distraction osteogenesis. 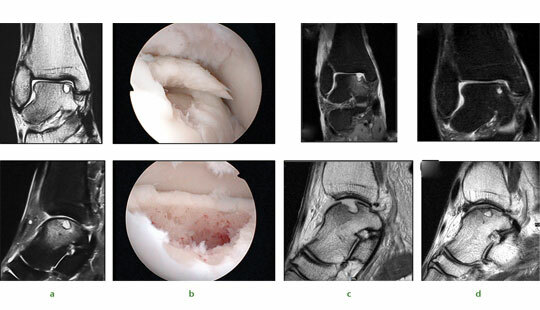 A second-stage arthroscopy with subchondral drilling and allograft ACL reconstruction was performed for chondrogenesis and stabilisation of his knee. We did not see any premature closing of the corticotomy with the use of PBSC and we believe that PBSC may have a signiﬁcant future role in malunion and nonunion surgery. Some of the most diffi cult lesions to treat in musculoskeletal medicine can be soft-tissue lesions. Patients sustaining meniscal and labral tears in the knee, shoulder and hip and nonhealing ligament avulsions are some of the most symptomatic patients. Current treatment options are limited to debridement or repair with poor healing rates. Emerging stem cell therapies raise the prospect of allowing the difficult-to-heal meniscal tears and other injuries some hope of repair, rather than resection. Some of our early results illustrate the potential beneﬁts of this therapy. We treated a 43-year old woman who had sustained both a chondral injury and a symptomatic large posterior horn intra-substance tear of the medial meniscus (Fig.5a). Intra-operatively her meniscus was found to be intact on the surface, and consequently we undertook needling of the posterior aspect of the medial meniscus to stimulate healing (Fig.5b). This was combined with treatment of the chondral lesion and subsequent injection of PBSC and HA. The patient was able to return to sporting activities by two years and at the time of review three years later, she was running three times per week. An MRI scan taken after three years demonstrates complete healing of the meniscal lesion (Fig.5d). A case report such as this does not provide irrefutable evidence that the meniscal healing was due to the PBSC, however, conventional wisdom tells us healing of such a lesion would not normally be expected after needling alone. Another, often difficult to treat, soft-tissue lesion that can potentially be addressed with a variety of treatment strategies is lateral epicondylitis (tennis elbow). The cycle of inﬂammation and repair has been addressed historically with wide ranging treatments from bracing and physiotherapy to surgical release and injection. We have found refractory tennis elbow to be amenable to minimally invasive surgery in combination with the application of PBSC with HA. We treated a typical case of a 57-year-old male demonstrating a recalcitrant lateral epicondylitis and MRI ﬁndings (Fig.6a) were consistent with an established tear of the origin of the extensor carpi radialis brevis (ECRB) muscle-tendon complex. The patient underwent percutaneous multiple drilling into the bony origin of the tear combined with ﬁve weekly injections of PBSC and HA. Following the intervention, an interval MRI scan at three months (Fig. 6b) showed almost complete healing of the degenerated ECRB muscle-tendon tear accompanied by a marked functional improvement. The patient resumed golf at four months after surgery and remained symptom-free at 18 months’ follow-up. Fig. 3 Images of a 36-yearold man who sustained chondral injury. Figure 3a – ankle joint showing medial talar dome chondral lesion with underlying subchondral cyst. Figure 3b – views following subchondral drilling around the lesion and into the cyst. Figure 3c – post-operative MRI scan following subchondral drilling (Sagittal PD and Coronal PDFS). 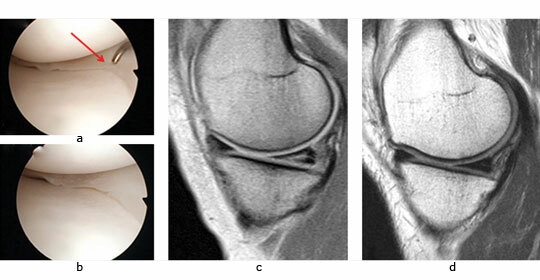 Figure 3d – MRI scans at nine months showing healing of the chondral lesion. Fig. 4 Radiographs of a 51-yearold man who presented with left knee pain and instability, showing a) distraction osteogenesis and evidence of callus formation one week after injection of PBSC into corticotomy site (red arrow), and b) signiﬁ cant growth of new bone after four months. Earlier in this article we posed this question: to what extent is total recovery and regeneration of musculoskeletal injuries now possible with stem cell therapy? The evidence in the literature and from our own experience suggests that it is possible to treat a variety of injuries with this technology, but we have yet to fully realise the potential of stem cell therapy. The indications for this type of therapy are broadening constantly, and we have begun to widen the scope of treatments to other conditions. We have had particular success with diabetic foot ulcers which were previously thought to be untreatable. We now know it is possible to treat ulcers presenting with microangiopathy and peripheral neuropathy by injecting autologous PBSC around the foot ulcers and along the vascular tributaries. The effects are the revascularisation of distal vessels and associated reversal of peripheral neuropathy and subsequent ulcer healing. In addition to the regeneration of neurovascular structures, bone and articular cartilage, stem cell therapy has been applied to avascular necrosis of the hip. Multiple drilling through the neck into the hip joint allows access channels to be established. Post-operative intra-articular injections of PBSC with HA apply the same concept as chondrogenesis with stem cells. Injections around the drill holes into areas of avascular necrosis can re-establish vascular in-growth and promote osteogenesis. Furthermore, comminuted intraarticular fractures following stable ﬁ xation beneﬁ t from post- operative injections of PBSC with HA. By enhancing the healing potential of the bone and articular cartilage, areas of chondral damage can be repaired with tissue resembling hyaline cartilage rather than ﬁ brocartilage. We would expect hyaline-like cartilage to be more advantageous than ﬁ brocartilage formation which may result in subsequent osteoarthritis and has the potential to degrade the patient’s quality of life. As stem cells are pluripotent cells, it is logical to assume that the single cell lineage may have beneﬁcial effects on more complex injury patterns. Stem cell therapy offers the tantalising promise of a solution to promote healing in the treatment of complex cases. The cells possess the ability to repair and diff erentiate into articular cartilage, bone, tendon, ligament, neurovascular structures and soft tissue, giving the exciting potential for one biological agent to augment the healing of all these tissues. This technology may ﬁnd ample application in the future in areas such as multi-ligament knee reconstruction. The potential beneﬁt for stem cell therapy is highly signiﬁ cant, and utilising this technology where athletes may bank cells for future use offers a unique advantage over other two-step procedures such as autologous chondrocyte implantation. The application of this innovative technology is, however, currently limited by the need for a substantial evidence base to prove the early promising clinical results and convince the medical fraternity. Fig. 5 A 43-year-old woman presented with a chondral injury of her left knee accompanied by symptomatic intra-substance tear of the medial meniscus. Figure 5a – intra-operative view of the posterior aspect of the medial meniscus showing intact surfaces. Figure 5b – arthroscopic view after multiple needling into the posterior aspect of the medial meniscus. Figure 5c – pre-operative MRI scan showing intra-substance tear of the posterior aspect of the medial meniscus. Figure 5d – MRI scan after three years showing complete healing of the meniscal tear. Fig. 6 A 57-year-old man presented with a recalcitrant lateral epicondylitis (tennis elbow). Figure 6a – preoperative MRI. Figure 6b – MRI scan at three months showing satisfactory healing. Dominici M, Le Blanc K, Mueller I, et al. Minimal criteria for defining multipotent mesenchymal stromal cells. The International Society for Cellular Therapy position statement. Cytotherapy 2006;8:315-317. Nöth U, Steinert AF and Rocky ST. Technology insight: adult mesenchymal stem cells for osteoarthritis therapy. Nat Clin Pract Rheumatol 2008;4:371-380. Chen X, Armstrong MA, Li G. Mesenchymal stem cells in immunoregulation. Immunol Cell Biol 2006;84:413-421. Wakitani S, Mitsuoka T, Nakamura N, et al. Autologous bone marrow stromal cell transplantation for repair of full-thickness articular cartilage defects in human patellae: two case reports. Cell Transplant 2004;13:595-600. Saw KY, Anz A, Merican S, et al. Articular cartilage regeneration with autologous peripheral blood progenitor cells and hyaluronic acid after arthroscopic subchondral drilling: a report of 5 cases with histology. Arthroscopy 2011;27:493-506. Saw KY, Anz AW, Stabile K, et al. Articular Cartilage Regeneration with Stem Cells. In Dragoo L, ed. Modern Arthroscopy. Rijeka: InTech, 2001:129. Jakobsen RB, Engebretsen L, Slauterbeck JR. An analysis of the quality of cartilage repair studies. 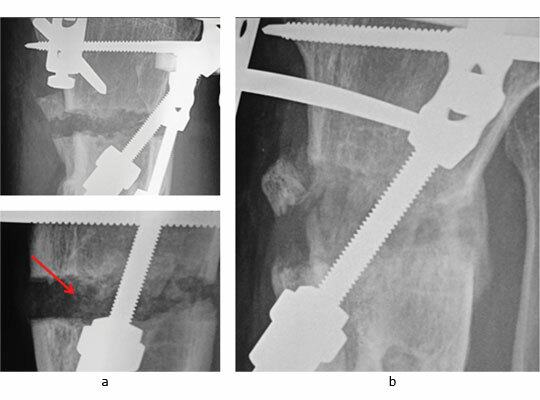 J Bone Joint Surg [Am] 2005;87A:2232-2239. Lubowitz JH, Appleby D, Centeno JM, Woolf SK, Reid 3rd JB. The relationship between the outcome of studies of autologous chondrocyte implantation and the presence of commercial funding. Am J Sports Med 2007;35:1809-1816. Magnussen RA, Dunn WR, Carey JL, Spindler KP. Treatment of focal articular cartilage defects in the knee: a systematic review. Clin Orthop Relat Res 2008;466:952-962. Nakamura N, Miyama T, Engebretsen L, Yoshikawa H, Shino K. Cell-based therapy in articular cartilage lesions of the knee. Arthroscopy 2009;25:531-552. Saw KY, Anz A, Jee CSY, et al. Articular cartilage regeneration with autologous peripheral blood stem cells versus hyaluronic acid: a randomized controlled trial. Arthroscopy 2013;(Accepted for publication). Lubowitz JH, Provencher MT, Poehling GG. Two steps forward, one step back. Arthroscopy 2011;27:1453-1455. Lubowitz JH, Provencher MT, Poehling GG. Stem Cells in Arthroscopy. Arthroscopy 2012;28:891-892. Obermeyer TS, Yonick D, Lauing K, et al. Mesenchymal stem cells facilitate fracture repair in an alcohol-induced impaired healing model. J Orthop Trauma 2012;26:712-718. Zhao Z, Hao C, Zhao H, Liu J, Shao L. Injectable allogeneic bone mesenchymal stem cells: a potential minimally invasive therapy for atrophic nonunion. Med Hypotheses 2011;77:912-913. Granero-Moltó F, Myers TJ, Weis JA, et al. Mesenchymal stem cells expressing insulin-like growth factor-I (MSCIGF) promote fracture healing and restore new bone formation in Irs1 knockout mice: analyses of MSCIGF autocrine and paracrine regenerative effects. Stem Cells 2011;29:1537-1548.